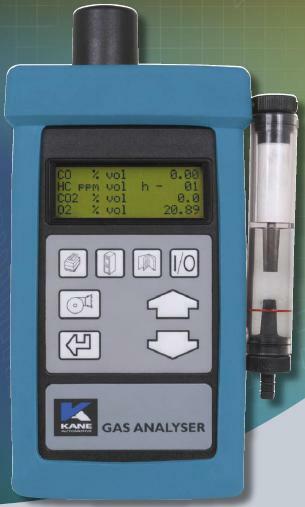 This product is now obsolete and has been replaced by the Auto Plus 4-2 & Auto 5-2 Emission Analysers. The Kane Auto 4-2 & 5-2 Series Exhaust Gas Analysers are truly portable and set new standards of convenience and ease of use. Weighing just 1kg, the handset fits comfortably in the hand and can run for up to 4 hours on its internal re-chargeable battery. Ideal for emission diagnostics, tuning and pre-compliance testing. The programmed recalibration procedure permits low cost servicing either on site or at approved European service facilities. The software includes pre-programmed language options, pre-programmed emission test, auto store & data logging, upgradeable analyser firmware and service software. An automatic leak test can be performed on every power up. Integral flow checking provides warning of probe blockages. The analyser goes to the car, not the car to the analyser! No need to shuffle vehicles around. For intermittent faults or for NOx analysis (engine under load conditions), why not data log the results during a road test? Use the PC software to upload and analyse the data as a spread sheet or graphically. With accuracy to OIML Class 1, you are assured of the highest metrology standards.